Hello! I'm Ellie from Homestitched. 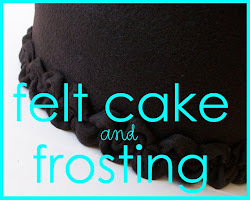 I'm so excited to be guest posting here today! She Wears Flowers is one of my very favorite blogs and Tammy is the sweetest. 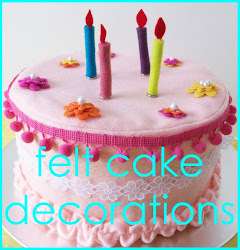 She was one of my very first bloggy friends (can I call you that?) and I'm so glad she asked me to post over here for the day! I started sewing a little over 8 months ago, just after my daughter was born. I am definitely a beginner, but not afraid to try anything. 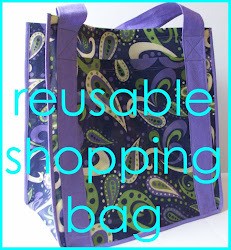 My blog, while mostly sewing, also contains other projects I'm working on. 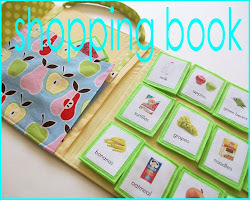 I love sewing and crafting so I'll try pretty much anything I can get my hands on. 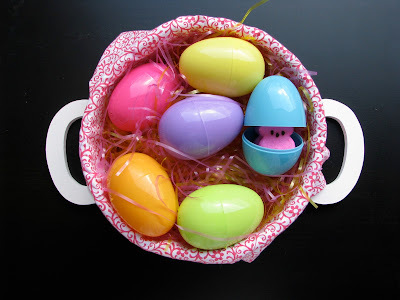 I've been dreaming about Spring lately so today was a perfect reason to try making these Easter Baskets with a vintage flair. Enjoy, and please stop by Homestitched. I'd love to have more followers and crafty friends. The cutest little fabric covered basket. SO, when I was at the thrift store a while ago I found this basket and knew just what I wanted to do with it. Want to make one? It's easy peasy. 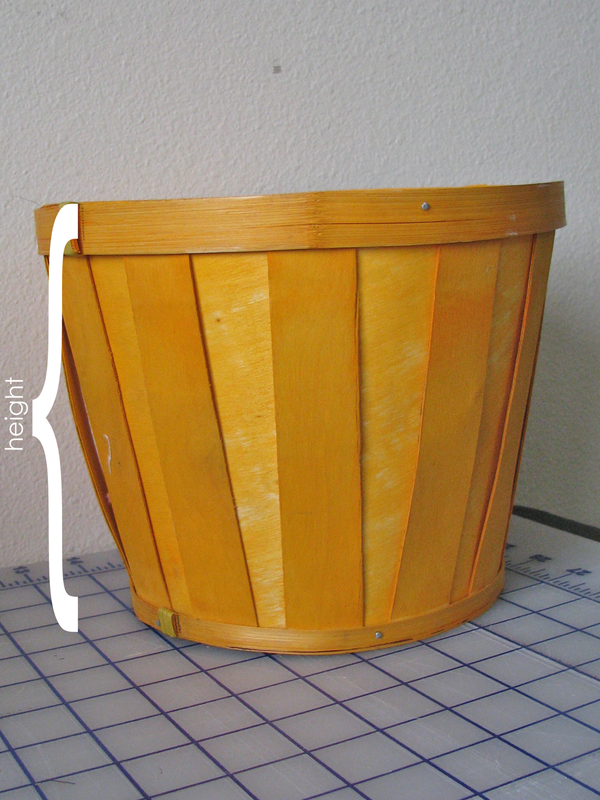 To measure the circumference I used a flexible tape measure around the outside of the basket for both the top and bottom. **these are the measurements you will use during the tutorial. 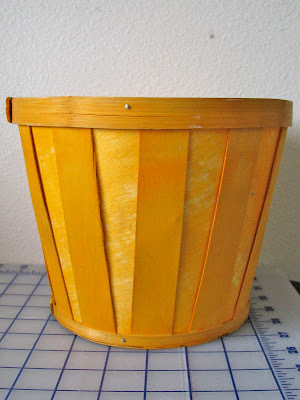 ***I spray painted the basket before I started the rest of this tutorial...sorry, no pictures. 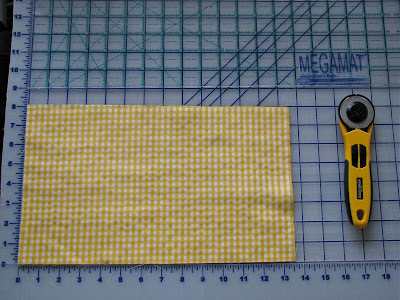 Cut two rectangles height x 1/2 top circumference. Mine turned out to be 8.5 x 14 (ignore the photo measurements, the yellow turned out to be too small and I had to correct it later). 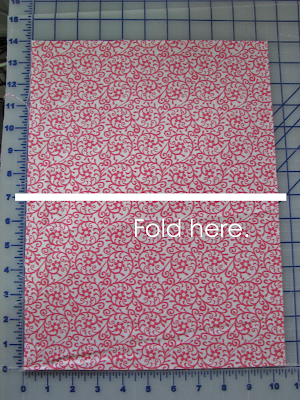 Fold both rectangles in half. Be sure your corners line up exactly. 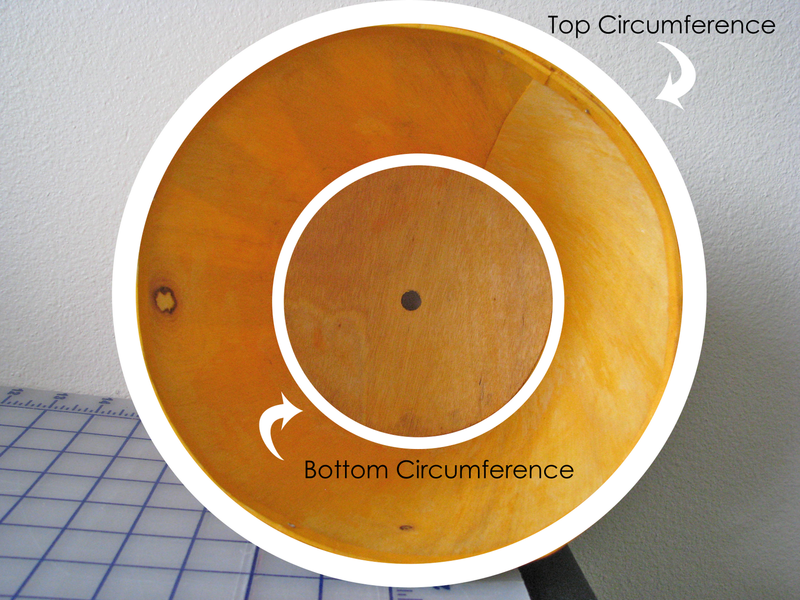 Take your ruler and line it up with the top corner and half the length of your 1/2 bottom circumference (1/4 of your full circumference). My 1/2 bottom circumference (which I wrote down earlier) was 11.5. 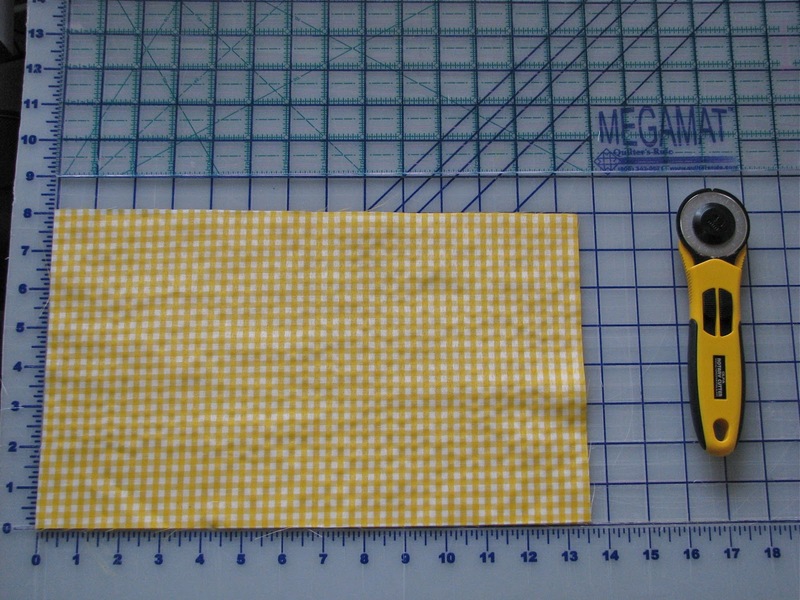 Half of that is 5.25, so that is where the bottom of my ruler is lined up. With right sides together, pin the trapezoids and sew with 1/2 inch seams down the slanted edges only. 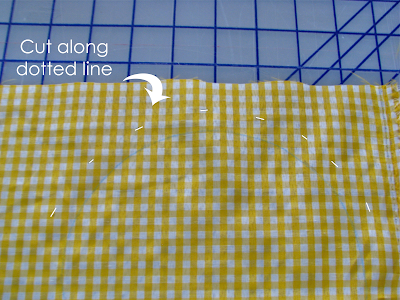 Take the basket and trace it onto a piece of fabric. 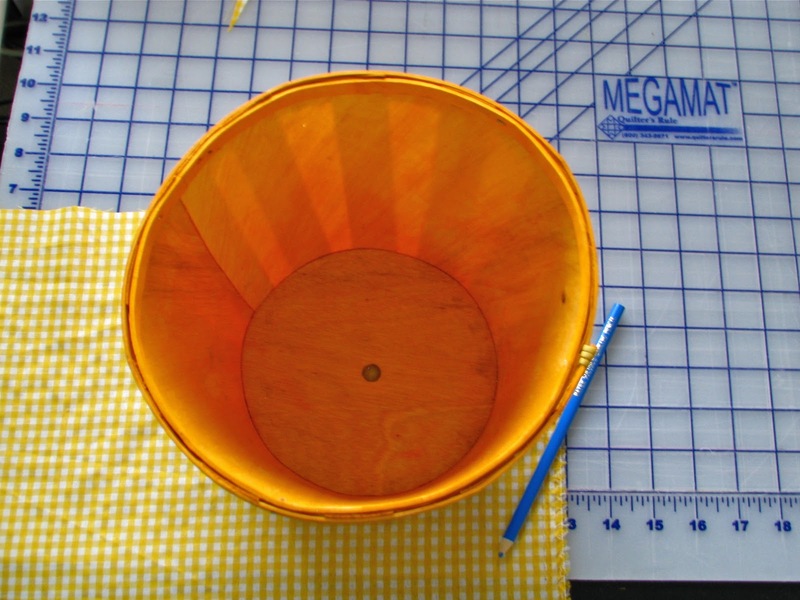 To account for seams I made marks 1/2 inch away from the traced basket and used them to draw a new circle. Then I cut along the new line. **It's really hard to tell in the picture, so I highlighted the marks. Pin with right sides together to the short end of the tube. 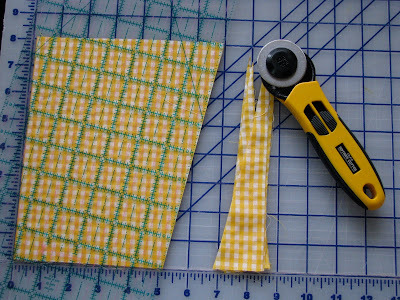 Sew together with 1/2 inch seam. 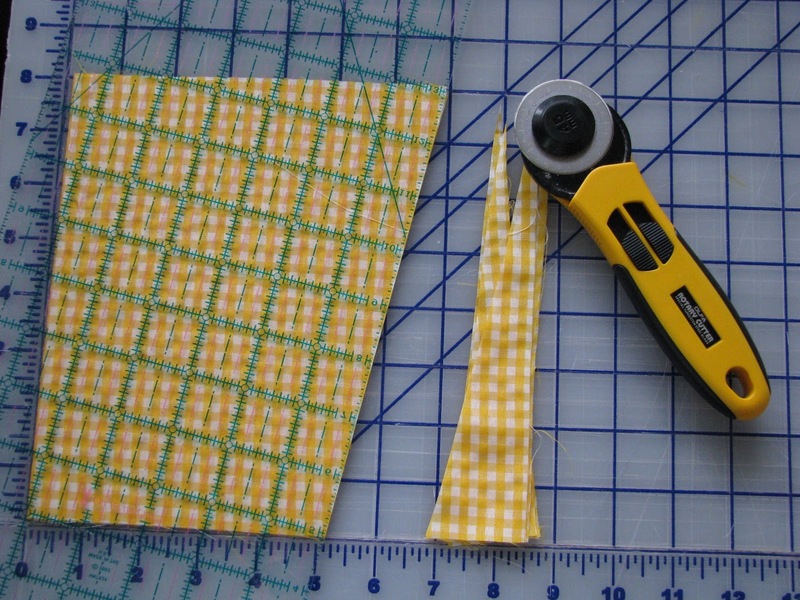 Take your fabric and cut 4 rectangles 10.5 inches by 1/2 top circumference. Mine turned out to be 10.5x14. You can adjust the 10.5 and make the handle longer or shorter if you would like. 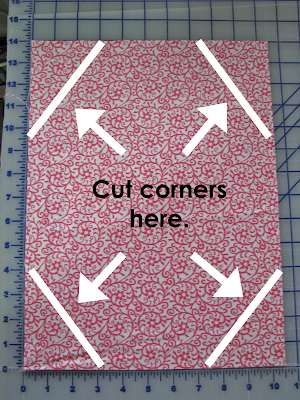 Fold the rectangles in half and cut the corners. I cut a triangle that took off 3 inches from the top and 4 inches from the sides. 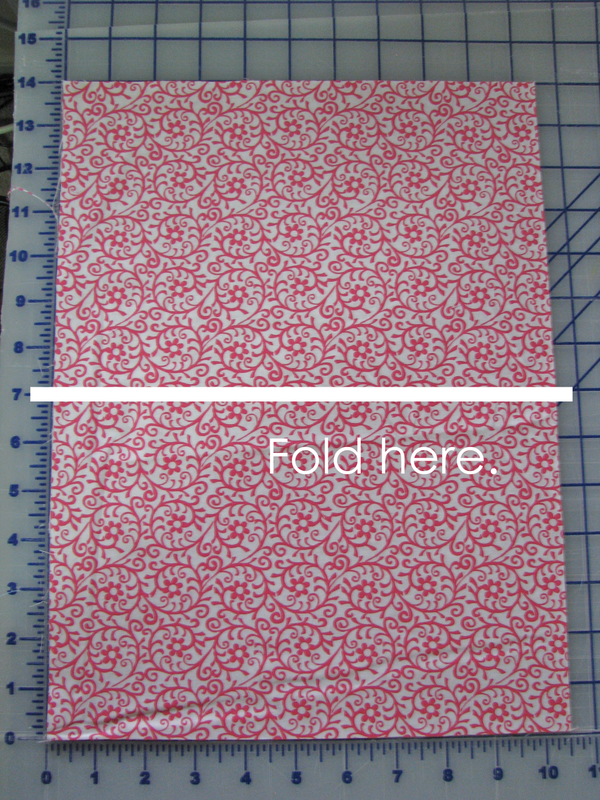 Fold cut edges over 1/4 inch and iron down on each of the pieces. Top stitch along folded edge only. Pin two trapezoids right sides together. 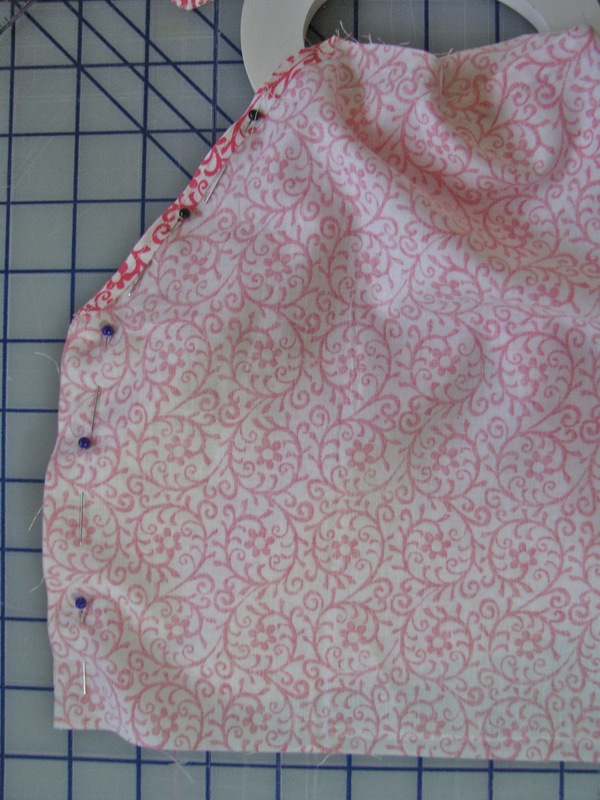 Sew with 1/4 inch seam along top (short end) only. 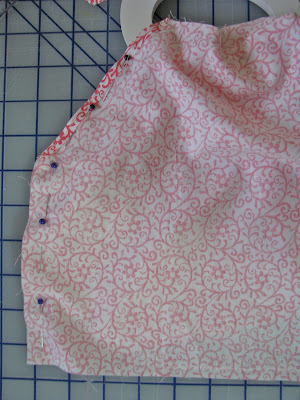 Pin both sides of the fabric around the handle. When you reach the top stitched section (previously sewn) sew directly over previous stitches instead of the 1/4 inch seam. Stop when your presser foot hits the handle. Repeat the above steps for the other handle. 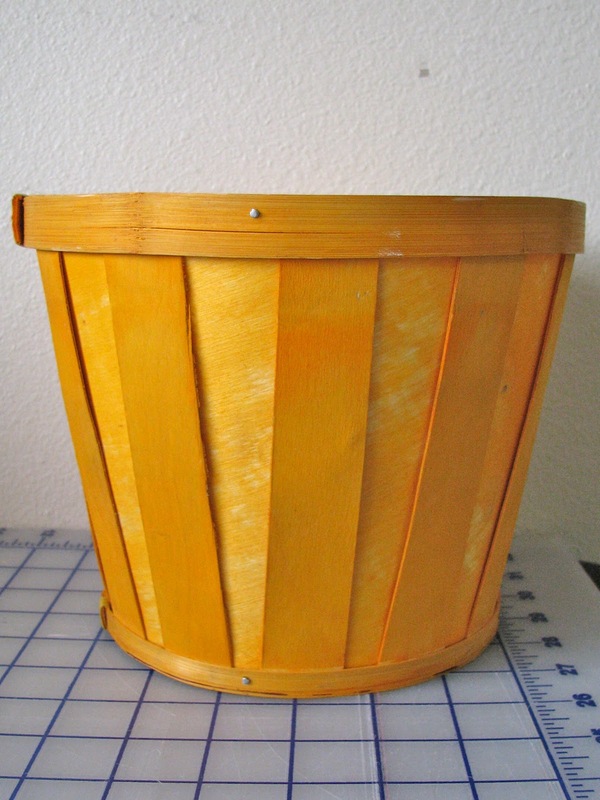 Using your glue gun, glue the handles to the outside of the basket (raw edges lined up with the top of the basket). I used the rim of the basket as my guide. That way, when you pull up the handles it will look even. 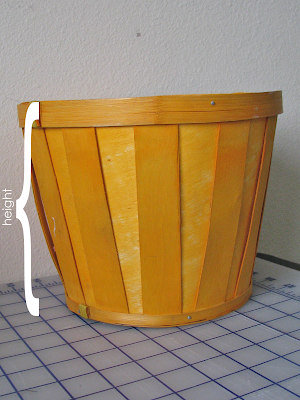 If you do not have a rim, draw a line on your basket to keep it even as you glue. Take the piece you set aside earlier. I tossed the yellow and remade it in pink. Sorry for the change up. Iron down the top edge 1 inch (more or less depending on how much you want showing). Top stitch to keep in place. Stuff inside the basket with right side facing out. 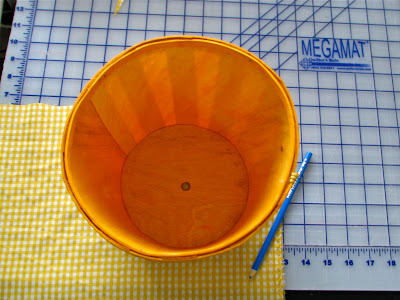 Glue the edge down directly over the rim to cover where you glued the handles before. And that's it! 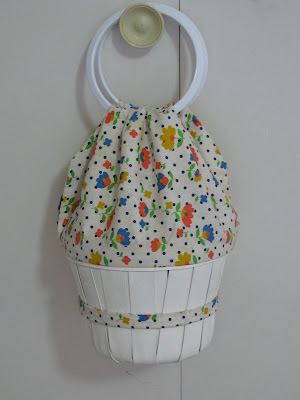 Now you have a Vintage-Inspired Basket to use for whatever you please. A perfect hiding place for my favorite Easter treat. Sick, I know, but I love them. Thanks so much, Ellie, I love this basket! 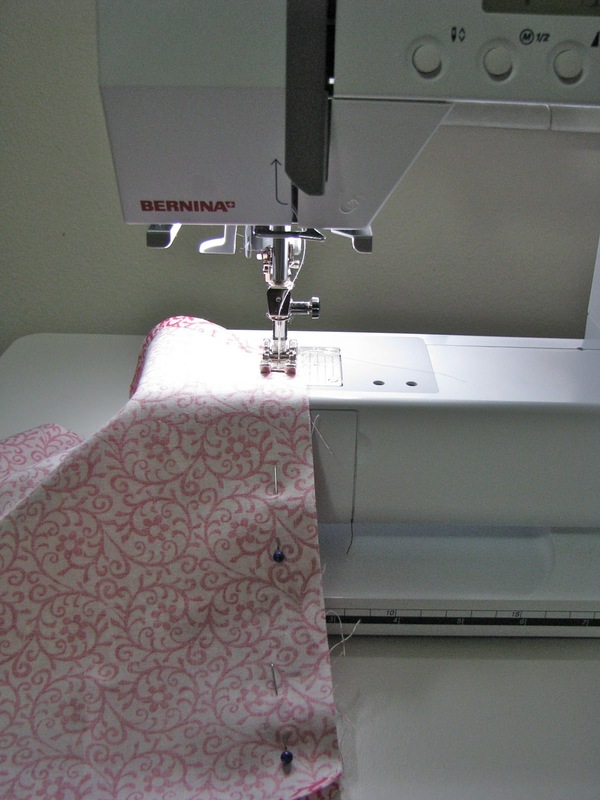 I have been so impressed with Ellie--it's hard to believe sewing is a new skill for her because she is so good at it! She's very creative and you won't want to miss a thing! 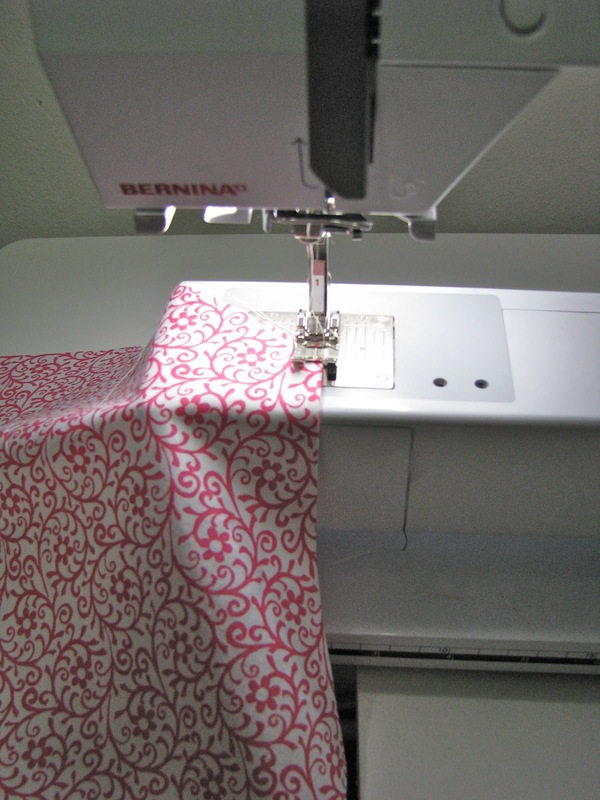 Be sure to go over to Homestitched and check this girl out! 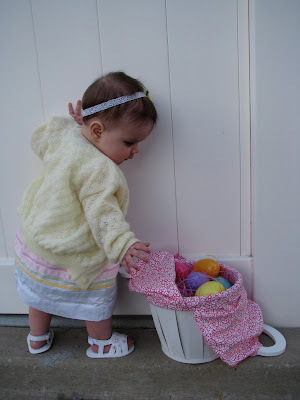 This basket is just precious...I absolutely love everything about it! And Tammy...I am loving your new look! Ellie. you are awesome. What a great idea. I am totally crushing on those baskets! Very cute basket, indeed. I love it. Tammy, I don't think I've said anything about your new banner. It is new, right? Now I'm starting to second-guess myself. Either way I like it.